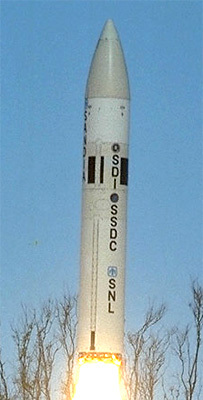 The STARS (Strategic Target System) are modified Polaris-A3 missiles used mainly for simulating missile warheads for SDIO (and follow-on organisations BMDO and MDA). The STARS-1 is a refurbished Polaris-A3 missile with additional Orbus-1 as third stage. The STARS-2 features also the liquid fueled ODES (Operations and Deployment Experiments Simulator) fourth stage as a post-boost-module. STARS is used for payloads on reentry trajectrories. 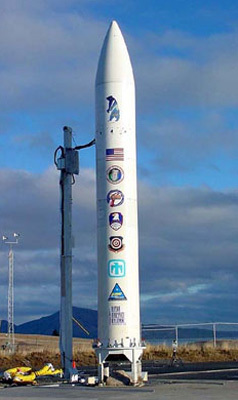 The first four launches were made from Kauai, later launches were also conducted from the Kodiak launch complex. With a Star-26 as fourth stage, modest orbital missions are possible. An orbital version for heavier payloads with a Castor-120 as first stage was also considered. Currently no plans for orbital missions are pursued. The first flight from Kodiak was terminated, when a faulty signal activated the self-destruction system. Both IFT-13C and IFT-14 targets were not intercepted, when the OBV interceptor failed to launch. The STARS-4 vehicle used for the AHW mission was a modified version with a different boattail, grid stabilizers and a longer fairing.